In the recent climate of the surgical profession, there is a growing risk of unemployment or underemployment for new General Surgeons in Ontario. Complicating matters is a growing supply of General Surgeons, not only generated within the province but also more competition coming from surgeons transferring from other provinces or international medical graduates. Before competing for that position, take the time to evaluate the skills that you have to offer the profession; in turn, consider the lifestyle/professional goals/objectives/workload/ remuneration that you want from your specialty. You will have to negotiate for some aspects but realistically concede on others. What potential income or billing level should I expect? What will my clinical and academic responsibilities be in the position? What will my financial obligations be to the practice, group or department? What other requirements, duties or responsibilities will the position demand? Learn expected level of income and gross billings before going into an interview. Ask colleagues, program director, head of your department, etc.. The OMA might have data in this regard readily available for members also. If the position is in a group, association or department, what will the new physician’s responsibilities be? What workload will be expected? What will the on-call responsibilities be? For university appointments, will there be expectations in terms of publications in peer-related journals? What are the clinical/teaching/research responsibilities? Who has to submit the research applications? Who hires/pays for office administration? Is the term indefinite or specified otherwise? What is the departure clause and potential penalties? Will this be a sole proprietorship or will you be part of a partnership, group or department? Will you be sharing the costs (i.e. lease/mortgage, admin, office expenses, insurance, etc.)? Ask a lawyer to check a group agreement to ensure fairness and equity and understand potential liabilities of a group. How about decision making - how is it done and do you have an equal vote? Depending on your jurisdiction, the MOHLTC might offer an added incentive program (alternative payment plan) in addition to your fee for service billings. Many hospitals and communities also offer financial incentives such as moving cost remuneration, signing bonuses or relocation allowances, to attract certain specialists. Other benefits could include insurance, holidays, CME time, payment of professional dues, pension plans, car allowance/parking, start-up loans, etc. How much OR/endoscopy time will you be given? Is the procedure room appropriately staffed? Who is in charge of lining up surgical assistants? Is office space available? Do you select/hire support staff or will it be assigned? If you will be doing research, who will provide the research staff/equipment? Is there parental/sick leave? 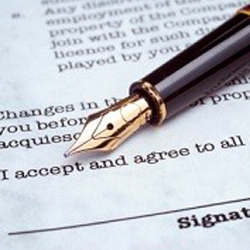 IMPORTANT NOTE: Always have a lawyer (employment/business) review any contract before you sign it. Job Listing Sources: See our joblisting page for the latest postings and other resources. Source: CMA Module 9 - Principles of Negotiation; CMA Module 11 - Lcoums: Negotiating a Mutually Beneficial Locum Contract*; CMA Module 13 - Evaluating Practice Opportunities: Specialists.